Made from scratch the old fashioned way. The way it used to be, the way it should be. 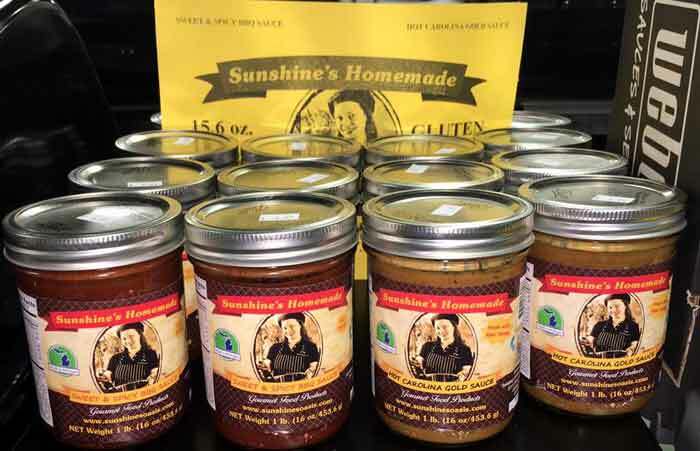 Sunshine’s Homemade is Sunshine’s unique brand gourmet food that is cooked the old fashioned way – starting with simple ingredients and made from scratch. The nutrition, time and love that goes into Sunshine’s Homemade brand recipes sets these sauces apart from all other brands. Michigan made BBQ and Carolina Gold Sauces are becoming a Michigan family tradition. Sunshine’s Homemade Sweet & Spicy BBQ Sauce is a bold and savory southern style recipe with a unique blend of sweet and spicy flavors. Use for dipping your favorite fried food, on burgers or sandwiches, grilled or baked on ribs, chicken, steak or pork, in pulled pork and more. Once you taste this Sweet & Spicy BBQ sauce you will see why people say that it’s the best BBQ sauce they’ve ever tasted. Made from scratch and with no MSG, no gluten, no corn syrup, no additives or preservatives. Sunshine’s Homemade Sweet & Spicy BBQ Sauce has no comparison. Try it and you’ll be hooked. One jar of sauce is never enough! Sunshine’s Hot Carolina Gold Sauce is Sunshine’s newest recipe and is a Michigan made Gourmet food product made from scratch, the old fashioned way. The way that it used to be, the way that it should be. Only natural ingredients, with NO MSG, no gluten, corn syrup or artificial ingredients are used. This sauce was inspired by the Carolina style grilling sauce that pleases mustard lovers. Use for dipping pretzels and nuggets or on sandwiches and pizza, or on your favorite cuts of meat. Excellent on wings, pork tenderloin and chicken breast, this is very versatile and can also be substituted in any of your mustard recipes.